Los Bailadores Del Sol of Central Washington performing Veracruz Jarocho. The “World Without Walls” show was an explosion of color and joyous dancing. The production started at 1 p.m. Saturday in McConnell Auditorium. Los Bailadores de Bronce performed four regional dances: Concheros, Guerrero Costa Chica, Nayarit Mestizo, and Jalisco. 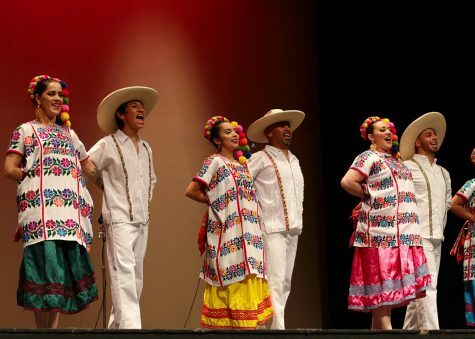 CWU’s Los Bailadores Del Sol performed two varieties of dance from Veracruz: Zapateado Veracruzano and Veracruz Jarocho. 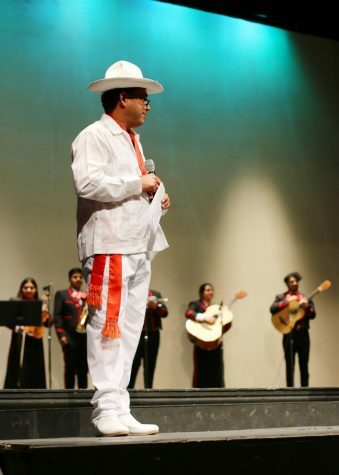 The dances were broken up by musical performances from CWU’s Mariachi Del Centro, two of which featured Latin Opera Grammy Winner and Bolero Tenor Jose Iniguez. Of the approximately 100 people in attendance, some sang along and clapped to the music, while others sat back with smiles on their faces as they listened to the sound of the guitars, violins, and trumpets of the mariachi band. 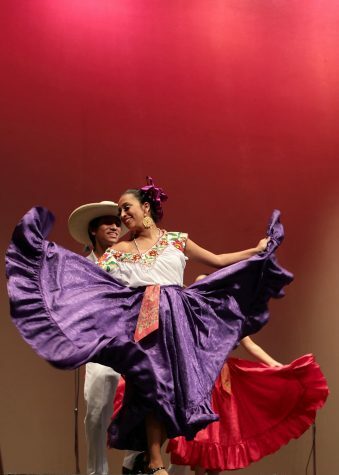 Bailadores De Bronce performing a traditional courtship dance. CWU senior and founder of CWU’s Ballet Folklorico Randy Robert Lopez believes in preserving the traditions and rituals of Mexican folklore. Lopez said that to properly reproduce the traditional dances of mexican folklore, it is required to be well versed in the diverse history and rich culture that comes with each of the dances. Lopez said that he has been studying and performing traditional Mexican Folklore since the age of seven. He began his career in elementary school when he joined University of Washington’s Los Bailadores De Bronce, a professional dance company specializing in traditional Mexican music and dance. By the age of 15, Lopez had graduated from Cornish College of the Arts and started his own performance arts company, Los Bailadores de Sol of Yakima. Lopez said the inspiration for “World Without Walls” stemmed from President Trump’s proposal to erect a border wall between the U.S. and Mexico. The title “The World Without Walls” represents Lopez’s belief that we as humans need to stop putting up walls and start working together. Bailadores De Bronce performing Guerrero Costa Chica. “I just feel like this whole world is going backwards, instead of going forward we’re going backwards… regardless of what our president or any president in this world does, we all need to stick together. We need to work together because if we don’t work together we’re not going to accomplish a damn thing,” Lopez said. According to Los Bailadores de Bronce Executive Director Adrian Olivas, “The World Without Walls” is about history, culture and the notion that people can go anywhere in the world and co-exist. Olivas explained that the dances they performed have influences from countries all over the world. 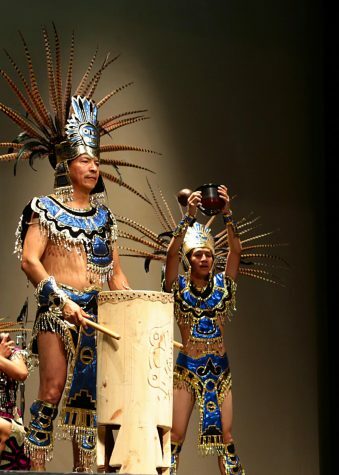 Drummer in traditional aztec costume during the World Without Walls event. 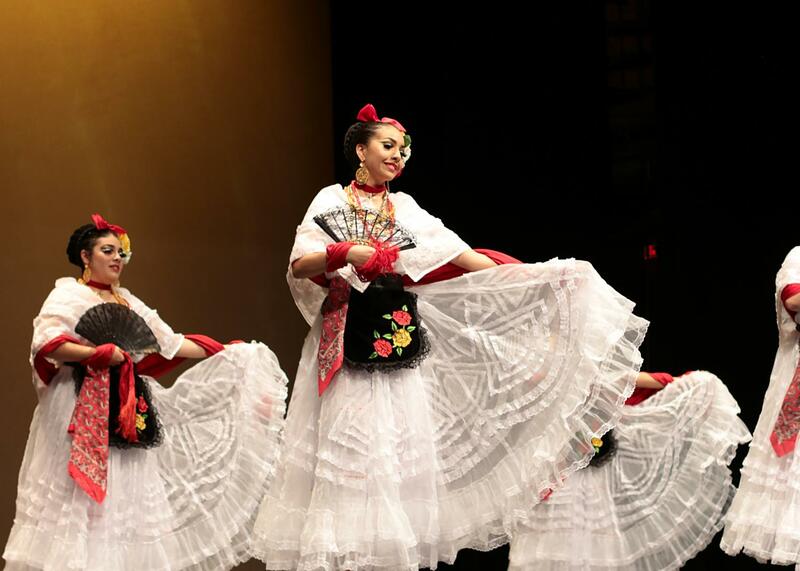 “Whenever we have the opportunity to speak, we make it a point to show people that even though this is from Mexico, the influence that every dance has is from other people’s customs,” Olivas said. In lieu of charging for admittance, Lopez teamed up with the Allied People Offering Year-Round Outreach (APOYO) Food Bank and asked that the audience bring a non-perishable food donation. APOYO is an Ellensburg based non-profit organization that provides those in need with food donations twice a week. APOYO was founded by CWU Professor Philip Garrison in 1999 and operates on CWU’s campus, according to the APOYO website. According to Lopez, this will not be the last opportunity for the people of Ellensburg to experience “World Without Walls.” Lopez is on his way to graduating from CWU this year with a bachelor’s degree from the dance program and plans to put on a bigger production next year as part of his master’s work. Lopez is looking into involving CWU’s dance department in his future productions, and he said that he wishes to have CWU dance students perform instead of having to hire dancers from groups outside of the university. Randy Lopez introduces Jose Iniguez at the beginning of the World Without Walls event.